selected to play for Aboriginal All Stars five years straight though he chose not to go to Perth for the training. He knew he had potential then but he didn’t really think about it too much at that me. Even winning an art award while at CBASS was fun to him. This was during this me that his people started getting their homelands back and families were returning to the forefather’s original spiritual country. It was an exciting me and Edwin didn’t want to miss that one for the world. 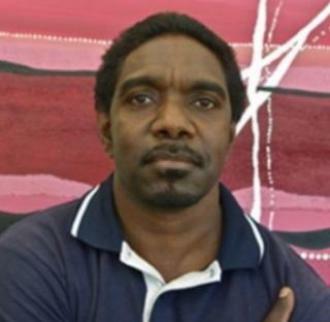 Drawn back to country, Edwin returned to Yakanarra his father’s side, to get more connected and involved with his people. Art was a reason to go back to country. Edwin felt like art was an opening for country to welcome him back. His current painting style draws from his given names from his mother and father’s side. His names show him ways to explore painting in new contemporary ways. The names are like pathways that he follows. Edwin paints stories told from dreams.